I think, when it comes to knitting, I've lost my grip on reality. 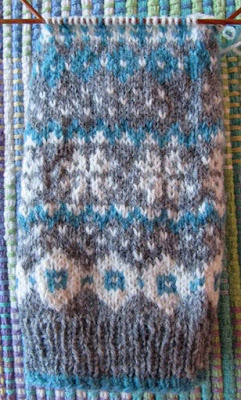 I've always been a fan of fair isle knitting and this has intensified after visiting Shetland and seeing the wool and the fabulous sweaters. A couple of weeks ago I came across a group on Ravelry called Stranded. They have issued a challenge for 2016: finish 16 stranded projects in 2016. Sure, why not? I can do that. Really??? The nice thing is that you don't have to start and finish this year....just finish a stranded project. I've got a few on the needles and I thought this would help to give me the incentive and momentum to finish them, and maybe it will. The downside is that most, but not all, of my stranded projects are sweaters. I'm going to have to stay focused. As if one knitalong (also know as a KAL) wasn't enough, I joined a couple of others - one is making a cowl and the other, a pair of adult-sized mittens. I didn't know that January was Mitten Month! Both projects are stranded, so they'll count towards my total. Yesterday I started the Snowflake Mittens and I'm up-to-date on the clues. Clue #3 comes out tomorrow. However, mittens come in pairs. This picture isn't great, but you can get an idea of what I'm knitting: I'll have a better one later with the mitten lying flat, ends woven in (instead of hiding on the inside) and there is a thumb. If I don't finish 16 projects before the end of the year, it's okay. I'll be thrilled if I can finish all or most of these. I should probably add in some small, quick-to-make items. ps....Go Broncos! They're playing, and hopefully winning, this afternoon.